Even though you might not be able to find all the information you need here, you can still use this piece to discover what it is you still need to learn. That is because you will have the tools to find out more. Almost any lock that you encounter in the real world is going to be a basic pin tumbler lock. Whether it is a deadbolt, door knob, or padlock, the most common type of lock uses this type of mechanical setup. If you already know how a pin tumbler lock works from the various articles I have written (or for some other resource), then feel free to move on to the next section. But without any knowledge of how a lock functions, it is unlikely that you will be able to manipulate the lock effectively. For effective lock picking, know how the lock works. Sometimes referred to as the lock housing or the book, the bible of a lock remains stationary during the use of a key. The reason it will be referred to as the bible is mainly due to preference, and because it is a term that is difficult to confuse or conflate with other parts of the lock. When the proper key is inserted into the lock (or lock picking is successful), the springs and driver pins will pass the shear line and be in the bible exclusively. This part of the lock is at times called the “core” or “cylinder”, however, both of those terms are also sometimes used to refer to the plug and the bible together. So for clarity, this part of the lock will be known as the plug for the purposes of this article. The plug is solely the cylindrical length of metal that rotates within the bible of the lock, once the key is inserted. You can easily distinguish the plug of the lock because it has the keyway. You insert your key, or lock pick, into the plug to interact with the pins. When the plug can rotate, the lock can open. This rotation means that the key pins are in the plug (below the shear line). Milled into the bible and plug are long, interconnecting, holes. These holes are filled with pins (we will talk about the pins more down below). The pins are stacked with a spring resting in the bible, exerting pressure on the stack of pins. The pin chambers of the bible line up with those in the plug. This allows the bible to be connected to the plug. As long as the pins remain overlapping in the plug and the bible through the pin chambers, the plug cannot rotate, and the lock cannot open. In order for the plug to be able to rotate within the bible of the lock, there needs to be space between the two parts. This gap is referred to as the shear line. If anything blocks the shear line, then the lock will not open. For the lock to open, the pin stacks need to divide at the shear line. Nothing can extend past the shear line from the plug into the bible. Make sure that pins are above and below the shear line, and that nothing is getting hung up there. Lock picking when there are security pins will get more complicated because pins will bind at the shear line and not above or below. When you are inserting a key or lock picking, the pins that your tools will interact with are the key pins. The key pins will have different heights. They are visually identifiable because they come to a rounded point on the end that will touch the key/lock pick. After the lock picking is successful, or the proper key is inserted, the key pins will remain in the plug. Driver pins are bookended by the springs on one side and the key pins on the other. Unlike the key pins, driver pins do not have a pointed end. They are commonly flat on both ends and will have a uniform height for each lock manufacturer. While lock picking, the driver pins will not come into direct contact with the picks. The driver pins are manipulated by lifting the key pins. When the lock is picked, the driver pins will be in the bible along with the springs. Every pin stack needs spring tension in order to keep the pins from being free moving. The pressure (downward or upward, depending on lock orientation) exerted by the springs can differ, even within the same lock. You can tell a pin has set on the right side of the shear line when you no longer feel spring tension on the pin of that chamber. The spring must compress and rest in the bible for the plug to rotate and the lock to open. All of the components of a lock work together so that they only open with the right key. 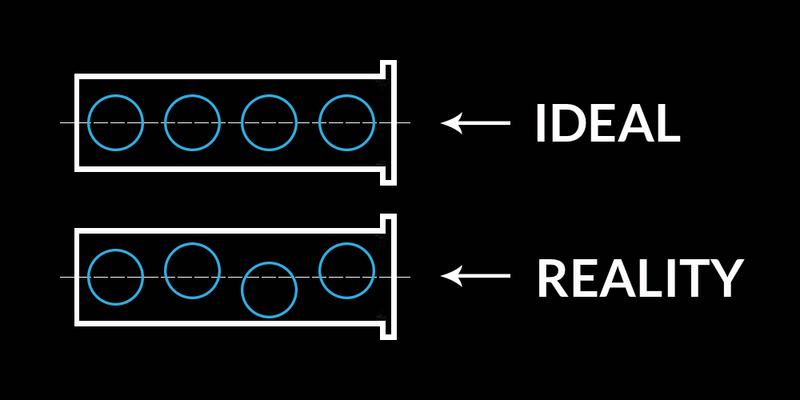 The idea is that one key opens one lock, but not another. Even if you and your neighbor have the average Kwikset deadbolt or Master Lock #3, you will not have keys that open each other’s locks (or that is the hope anyway). This is because of how the key works. You insert the proper key for a lock into the keyhole. The key pins (which are different sizes) are raised by the grooves on the key. Both the key grooves and the key pins correspond so that even with the pin stacks having different sizes, they are all elevated to the shear line. When the wrong key is inserted, a low cut on a key might not elevate the pin stack high enough for the driver pin to clear the shear line. A key groove that is too high, might elevate the pin stack so that the key pin is moved to block the shear line. Once the pins are on their respective sides of the shear line, there is a gap that allows the plug to turn. You can then turn the key, and the plug will rotate. The rotation of the plug moves a cam or tail piece that retracts a bolt or locking pawl. The lock is then open. I like to say that lock picking works a little like a key in slow motion, and with the sequence of events jumbled up. For example, you start with adding a bit of turning pressure to the plug. This puts tension on the pin stacks, which you will feel released as the lock is picked. You need to move each pin stack so that the driver pin gets stuck on the bible side of the shear line. This is the slow motion part of the lock picking process. Where one insert of the proper key would align the pin stacks, now you need several inserts and some deft movement of the lock pick. We will get more into this later, but it is important that you understand that lock picking works by tensioning and manipulating the pin stacks similar to how a key would open the door. This is the essential premise of lock picking. Why Do The Pins Stay Where They Are? Lock chambers have to be milled into the metal and rarely end up in a perfectly straight line or with the exact diameter as each other. This means that some of the chambers lean more toward the right or left. When you apply rotational tension to the plug, you can find the binding order of the pin stacks, by feeling for resistance. That resistance is the pin stack grinding against the metal of the pin chamber, meaning it is ready to set. The springy pin stacks do not have resistance because their pin chambers align farther off from the direction of rotational pressure. And once the binding pin is moved above the shear line, that pin chamber’s less than perfect alignment allows the plug to turn a bit. As the plug turns, the driver pin is given a ledge to rest on, so that the spring tension will not send it back into the plug. How Do Security Pins Affect Lock Picking? Although you should not worry about picking security pins right out of the gate, it is important to know what they are, in case you do encounter them. Security pins are driver pins, and even key pins, that are cut into shapes that have them catch at the shear line. This effectively jams the lock, as something is stuck between the boundary of the bible and the plug. However, there will be no spring tension, as the ledge meant to keep the driver pin on one side of the shear line is keeping the security stuck in place. This still makes the pin stack feel as though it is not under spring tension, leading to confusion as to why the lock is not picked. Lock picking requires particular tools for the job. As you already know, the basics of lock manipulation are that the plug must be tensioned and that the pins must be moved within the keyway. For more particular guidance as to what items you need in your first lock pick set, you can take a look at one of our past articles. But here are the basic tools you need in order to start lock picking. Tension tools come in a variety of shapes, sizes, and profiles. The two most common tension wrenches are the pry par (used mostly for “top of the keyway tension”) and the L Bend (used mainly for “bottom of the keyway”). It is important to have a tension wrench you can insert into the keyway without blocking the pins. You also need the tension tool not to slip in the keyway. If you lose tension, you undo all of the lock picking you had done. This will be the choice tool for how to pick locks the simple way. A rake works on the idea of moving all of the pins randomly and moving them fast. They are designed to give the best odds for opening a lock by chance. The most popular rake profiles are the L Rake (aka City Rake) and the Bogata. Hooks can be standard, offset, and come in many different sizes and thicknesses. They can be used to try and open the lock the simple way, but are more often used for the method of how to pick locks the hard way. With a hook, you are looking to find something that can move well in the keyway. It needs to be able to access the pins in a way that allows each stack to be leveraged. With hooks, you are looking to get the greatest range of motion while lock picking. There are many ways of getting lock picking tools. Each has their upsides and pitfalls. But no matter if money, supplies, machining resources, etc., are an issue, there is a solution for you. If you are willing to spend the money, you can save time and effort. But beyond those considerations, you will also take away some of the guesswork as to the quality you may receive. As long as you buy your lock picks from the right company, you can know what to expect. Though you might need to polish the tools or do some cleanup work, there are brands that can give you what you need to start lock picking straight out of the package. 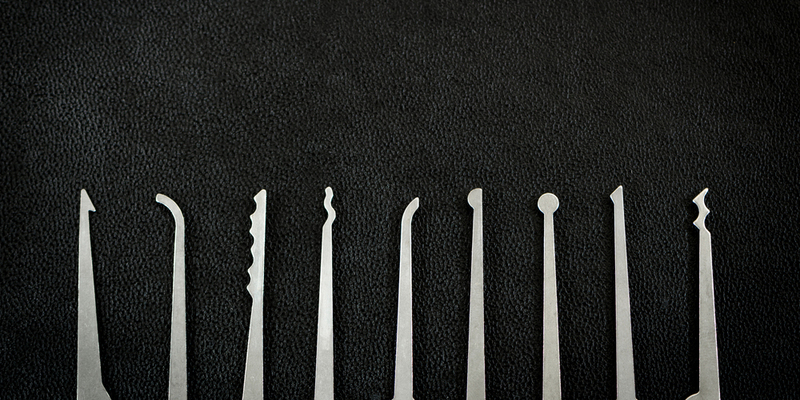 Lock picks are just pieces of thin metal that are cut to a particular shape. You can get the most popular lock pick profiles, and use those templates to fabricate your own lock picks. It will take the most amount of time, but you have the chance of getting something of higher-quality, greater uniqueness, and for less money than if you bought lock picks online. In a tight spot, you can use bobby pins or paper clips to fashion improvised lock picks. These types of lock pick tools have the greatest chance of not being effective. Where you might get dimensions wrong when making your own picks, improvised picks settle for what you can get. Often improvised picks are for people just looking to test out the lock picking hobby. They are not ready to make a serious time or monetary commitment. This is something you can do quickly and easily, but with mixed qualitative results. How to pick locks begins with proper tension. No matter how you are looking to go about lock picking, it all begins with how you tension the plug. There are different approaches to even something as simple as inserting the tension wrench into the keyway. Top of the Keyway – Many lock pickers have a preference for top of the keyway (TOK) tensioning because certain keyways can be obstructed with bottom of the keyway tension. Other practical reasons for preference toward TOK include the fact that they are double-ended, so each tool has two uses. Bottom of the Keyway – Most lock pickers start with bottom of the keyway (BOK) tension for the simple reason that most beginner kits only come with these types of tools. They can also be made easily out of windshield wiper inserts. With BOK you need to be very aware of keeping the tool from getting jammed up between the plug and the bible. Tensioning from the bottom of the keyway can quickly slip into preventing the lock from opening. Although you might be tempted to use bottom of the keyway tools, it may lead to many stumbling first steps when you begin lock picking. For that reason, TOK might offer a better initial success. Be aware of the types of problems you are potentially opening yourself up to. Besides the tools you are using, the biggest concern for tension is the amount you of pressure you are exerting on the lock. How you tension the lock decides your success with picking. From the Basics of Manipulation section, you already know that tension is the reason lock picking works. You can make many mistakes while tensioning. The pressure can be too strong so that all of all the pin stacks are binding. Or tension can be too weak so that there is not enough rotation for the driver pins to catch on the ledge of the shear line. Another classic mistake with tensioning is going the wrong way. If you tension the plug to the right when it should be to the left, you might be able to get the pins to the right heights, but the lock itself will not open. Always apply tension in the direction you would turn the key (if you were using one). When you pick a lock the wrong way. You will either need to start over or use a plug spinner to take advantage of the pins being at the shear line. To find out which way you need to apply tension, feel both ways with your tension wrench. Feel for the direction that has the most give. It is often the case that the way to turn the plug is the direction with the most give. Lock picking should be done with your tension turning towards the side with the most play. The simplest way of lock picking is a method called “raking”. As we have discussed in the Lock Picking Tools section, this method uses a rake tool. Raking is about moving all of the pins at once. The method does not depend on a deep understanding of what is happening in the lock. That is not the same as not needing any understanding of how a lock works. This means that you do not need to understand what is happening precisely in the lock as you manipulate it. But you need to know the different steps in the process. And if this is not working, what you need to do differently. Step 1 – Insert the tension wrench and apply tension. (Making sure it is rotating in the right direction). Step 2 – Insert rake into the keyway. Step 3 – Pull the rake in and out of the keyway. Step 4 – Move the rake up and down in the keyway. Step 5 – Repeat steps 3 and 4 for no longer than a minute or two. Step 6 – Turn the tension wrench to see if the lock is open. Step 7 – If the lock does not open, remove tension, change the amount of tension, and start again. The process is pretty simple, with not much skill involved. However, there are mistakes you can make. Mistake number one is the amount of tension you are using. And the second mistake is that the lock will not open with this type of simple lock picking. You might need to use the hard way of lock picking. Single pin picking (SPP) is the hard way of lock picking. This means you have to use something like a hook, as described in the Lock Picking Tools section. When you are single pin picking, it is exactly what it sounds like. You are moving each pin individually. You need to understand the innermost workings of the lock. This means knowing more than how a basic lock works. You need to know how your lock is working as you pick it. A big part of single pin picking is feeling for the feedback that the lock is giving you. The lock is communicating to you. You have to feel for resistance, spring tension, and everything happening in the lock. And you need to feel this pin by pin throughout all of the pin stacks. You are trying to go pin by pin to feel for the type of resistance that telegraphs the binding order. Because of the Basics of Lock Manipulation section, you know that the order you have to pick the lock is randomly determined. Find that order. Step 2 – Insert hook into the keyway. Step 3 – Starting in the back of the lock, lift each pin as you move to the front of the lock. (You can start at the front and work to the back if that is your preference). Step 4 – Ignore any pin stacks that are springy. Step 5 – Lift the pin that is giving you resistance. (Ease off of the tension slightly until that pin stack rises). Step 6 – You may hear a click and feel the plug rotate a bit. But you should also be able to feel the key pin lift without any spring pressure or resistance. Step 7 – Repeat steps 3 through 6 until all pins are picked. Step 8 – Turn the tension wrench to see if the lock is open. Step 9 – If the lock does not open, remove tension, change the amount of tension, and start again. The most difficult part of this process is understanding what the lock is doing. If you are not getting the feedback from the lock, or you cannot interpret the feedback, this is the wrong type of lock picking method. How to pick locks the hard way requires a more intimate understanding of the lock. More than knowledge, there needs to be a feeling that transfers a theoretical knowledge into a practical understanding. The best way to improve this skill is to practice. There is a bit of natural talent that can improve the timetable of progress, but anyone can get lucky or feel as though they have lost all of their progress. The trick is to stay calm and focus on the fundamentals. As we have already discussed in the Basics of Manipulation section, security pins change the way that manipulation works by adding a layer of additional complexity. It helps to know how to identify when a lock is not opening because of security pins. Because of how these pins work, they will give the feeling that the driver pins have set above the shear line, but the driver pins are actually jamming between the plug and the bible. The sensation you feel with a pin that has set in this way gives the misleading lack of spring tension you would associate with a set pin. This is why a security pin that is hung up on the shear line is called a “false set”. The likelihood of a false set can be increased when pin chambers are threaded or counter milled. This type of precaution creates more ledges in the lock for the security pins to catch on. The lock will often telegraph why it is not opening. This can be subtle, but if you don’t know what to look for, you are sure to miss it. To pick a lock with security pins, you need to know what type of security pin you are picking. In the world of locksport, you can get incredibly complicated and unique security pins. Pins such as the pin in pin security pins and hand sculpted designs can create many unique challenges, but there are too many possibilities to address. I will address the security pins you are most likely encounter, and that should help you to understand the types of approaches you should take when you know there are security pins in the lock you are picking. One of the most popular types of security pins you will find are spool pins. These security pins are the go to for most lock manufacturers. They have a capital “I” shape: thin in the middle, with more material on both the top and the bottom. This shape has the pin catch on the ledge caused by the imperfect pin chamber orientation. The driver pin gets hung up on at the shear line, without ever clearing it, but the spring tension will feel as if it is gone. When you get a false set with a spool pin, you will be able to see and feel a significant amount of rotation from the plug. This is because the thin part of the spool is allowing for rotation while still jamming between the bible and plug. Simply lighten your tension and push on the pin so that the pin can squeak past the ridge long enough to not catch on the ledge until it has cleared the shear line. You might drop other pins as a result of this lessening of tension, or overset a key pin so that it is jammed at the shear line. So be patient and precise. With the appearance much like that of a mushroom, the “T” shape has a similar effect as the spool pin. However, where the spool has a thin middle, the mushroom pin has a wide middle that slims only slightly as it approaches the “hat” of the “T”. The resulting slope of the graduated slimming, gets your tension to rotate the plug in order to force a ledge that will catch the “hat” of the “T”. The rotation of the plug will not be as dramatic, as it happens gradually and not all at once. But even with a different method of detection, they are picked successfully and unsuccessfully the same ways as spool pins. One of the most complicated security pins are serrated pins, which you have probably gathered, are serrated. This means that they are ribbed, getting thin then extending like several spool pins stacked and compacted. They do not feel all that different during a “false set” than a standard pin does when it actually sets. This makes them very difficult to detect. They might also make other pins feel as though they are binding. When it feels like other pins are ready to bind, while they are not, the sensation is that you have found the next step in the binding order, but cannot set the next pin. When everything feels like it should be going right, but nothing is, it is time to start anticipating serrated pins. Then it is time to ease off pressure and work the pins again. These false sets are the reason that raking is rarely effective on locks that use security pins. You will need to use single pin picking (described in the How To Pick Locks: The Hard Way section) to address each pin. This is one of the reasons there is a debate between the effectiveness of raking vs. single pin picking. You can rake the lock to a false set, but then it is time to find the binding order and work with each pin, one at a time. Remember, when you are working with the pins that you should never remove tension all together. You need to lessen the tension while still maintaining it. And make sure the lessening is not severe. The more severely you ease off the tension, the more likely you are to drop pins. The more pins you drop, the more time you will need to spend re-picking the lock. I just want to briefly discuss some different methods of opening locks. It is up for debate as to whether or not some of these methods are technically lock picking. But I would say they are. Lock picking is most simply defined as the manipulation of the components of a lock without the use of the working key. However, these methods below are not as straightforward as the simple way or even the hard way and require more understanding and tools for effective use. Though I will not go into too much depth, I think it is important to know about the other lock picking options. How to pick locks is not something that can simply be reduced to a few methods, each with a couple of steps. And for that reason, these additional lock picking methods serve to illustrate the complexity of lock picking. Now that you are familiar with raking, as described in the How To Pick Locks: The Simple Way section, you can better understand how pick guns work. Whether the picks guns are manual or electric, they still need a tension wrench, because they are working like a rake. The pick gun knocks the pins upwards (similar to a bump key) as you move the pick in and out of the keyway (similar to a rake). The idea being that this will semi-automation will make picking faster. You will need to set the device for how much you want them to move up and down. If the gun does not pop the pins high enough, they cannot set, and it will over-set pins if the setting is too high. Because this method does not give the different pin stacks individual attention, it is unlikely to be effective when the lock has security pins. A bump key works a bit like a pick gun, but with no need for tension. As you are trying to turn the key, you strike it with a hammer. The hope is that the driver pins will jump up into the bible as the key is hit with the hammer. In that instant, the shear line will be clear, and the key can momentarily turn the plug. A bump key is a key that fits inside the keyway and has every groove cut to the lowest possible depth for that make and model of lock. You will need a specific bump key depending on the lock you are trying to open. There are locks that are un-bumpable based on how they are constructed (anything that doesn’t use a pin tumbler system). For more insight into bump keys, you can pick up additional information in articles we have about how to prevent lock bumping and how bump keys work on cars. Much like raking and pick guns, the attempt to move multiple pins at once makes this method less likely to work on locks with security pins. When lock pickers talk about bypassing, they differentiate it from lock picking because you are often not manipulating the lock components that interact with the key. What you are doing is bypassing the standard operation of the lock with a direct manipulation of the unlocking mechanism. These methods vary, but you can see a few examples in the list of locks that only offer the appearance of security. In order to find bypasses, you can research existing bypasses that others have discovered, or research how the lock works on a mechanical level. But these methods take specific research. It does not matter how complicated a lock is if it can be bypassed. Security pins do not make a lock secure if they can be avoided. To protect against bypasses, a lock needs to know about the specific bypass technique, then take measures to defend against it. How the lock is secured can greatly affect how you will have to approach the lock picking. As stated earlier, deadbolts, door knobs, and padlocks can all be pin tumbler locks. And each one is going to have their own issues. Padlocks will often be loose on a chain, which means you will need to be able to pick them in hand. Lock picking in hand can take some practice as you try to find the right positions for holding your tools and the lock. Not every padlock can be disassembled, so you may not have the option to pick it as an exposed core. And if you do not have a vice, there is not any simple way to mount the padlock. Many lock pickers enjoy taking the lock core out of the padlock or deadbolt. This means that you will have the bible and plug without any other type of cylinder housing. With an exposed lock core, you are not getting the real feeling of what it is like to pick the lock in the wild. But if you are picking locks without any care for practical lock picking, this is fine. It is also a method of removing some of the noise and just focusing on the lock picking aspect of the lock. You can start by picking the exposed core and then try picking them in their natural housing. When a lock cannot be moved, such as in the case of door knobs and deadbolts, lock picking can become a little more straightforward. It is like working with the lock in a vice. You can mount standard locks in planks of wood or faux doors. This is perfect when you are trying to improve your locksmith skills. However, locks that are installed upside down can throw some amateur lock pickers, as they struggle to use bottom/top of the keyway tension with a different lock orientation. Lock picking is for professional locksmiths and lock picking hobbyists. It is never intended to be used for illegal activity. But more than just the intention of use, there are restrictions beyond what you do. In the United States, there are many things to know about how lock picking is treated by the letter of the law. Most states do not take an interest in the ownership of lock picking tools unless you are a criminal. In the states of Nevada, Virginia, Ohio, and Mississippi, the possession of lock picks may be used as evidence. The technical term is “prima facie evidence”. And that means (in a manner of speaking) that the evidence is assumed to be correct in its presumption until proven otherwise. Other than those states, you also need to worry about North Carolina, Tennessee, Illinois, and Kansas. All of these laws have very specific restrictions on the ownership of lock picking tools. 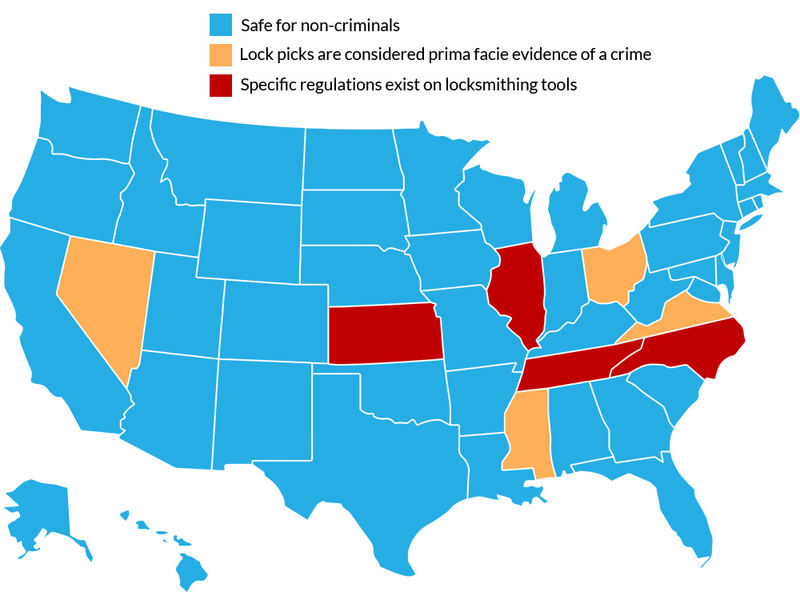 If you live in any of these states, you need to research your specific lock pick laws. In terms of the countries that definitely restrict the ownership of lock picks there is Japan, Poland, and Hungary. If you live in or are visiting any of these countries, there are fines and jail time associated with having lock picking in your possession. You should make sure that you are always complying with your local lock pick laws, even when you are traveling with lock picks. The first rule is straightforward. It exists so that you are never accused of anything ethically questionable. Don’t pick locks that “look” abandoned. Get permission or have ownership over the lock. Everything else opens you up to trouble. Never picking a lock that is in use is a little less self-explanatory, but it stems from concerns about how repeated lock picking will damage a lock. This is especially true when you are first trying to learn how to pick locks. Initial mistakes with lock picking can jam the lock, and pins can wear out as a result of extensive picking. When a professional locksmith opens your door with lock picks, they are only doing it once and with full knowledge of what they are doing. Little things like security pins and the orientation of a lock might throw you for a loop sometimes. But sometimes you can fail to pick a lock you have picked before. This might be because the lock is broken. As already stated, you can break a lock by picking it repeatedly. You might have a lock that is the same make and model as a lock you have picked, but the binding order and key bitting have made the pins hard to access in the way you are used to. There are even times when you can just lose your skills. It happens to a lot of lock pickers where they just can’t seem to open anything. You can get stuck for seemingly no reason. In any case, it is always good to take a break and step back from the situation. Try to assess what is happening, and re-devote yourself to the essentials of lock picking. Come back and read this article whenever you just can’t seem to get locks open like you used to. There is a lot to know when you are trying to find out how to pick locks. Locks can be incredibly complicated, but lock picking can be very simple. Begin by understanding the mechanics of a standard lock. 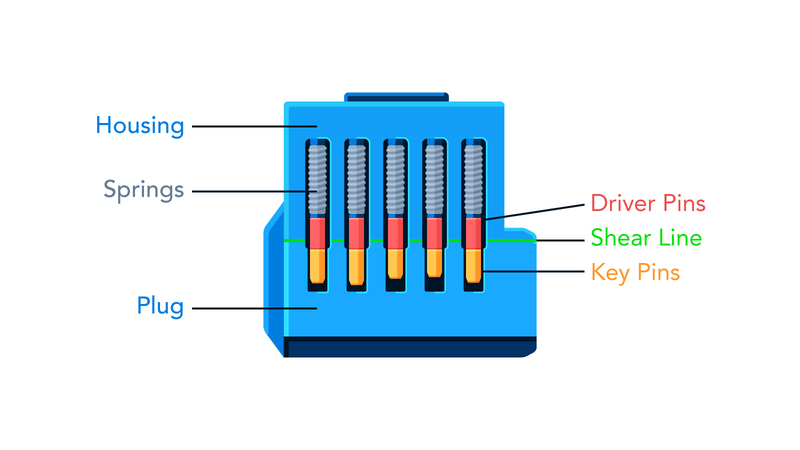 Know how a key works. Then apply the basics of manipulation to that understanding. After all of that, make sure that you understand the tools and methods you need for effective lock picking. And never break the law or the basic rules of lock picking. If you can do all of that, you can pick locks.